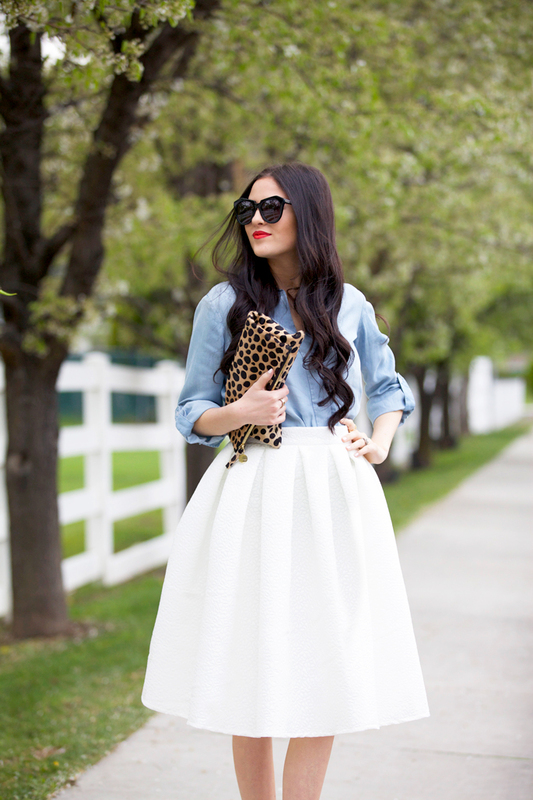 I don’t think there’s a more perfect combo than black, white and chambray with a leopard accent! I’m SO excited to do my very first outfit post wearing one of the pieces from my first collection apart of my clothing line! I’ve been taking outfit photos with Drew for my blog for almost five years and this shoot felt so special posing in this skirt that I designed! It’s a classic silhouette that features the most beautiful fabric (a subtle floral jacquard), the pleats add the perfect texture, the fit is amazing and it has pockets!!!!! So ladylike! I love this look!! You are beautiful!! The skirt is beautiful!!! It looks beautiful (: love this skirt. One of my greatest loves are buoyant skirts! Your designs are gorgeous, Rach! Congratulations!!! Your style is just so flawless. 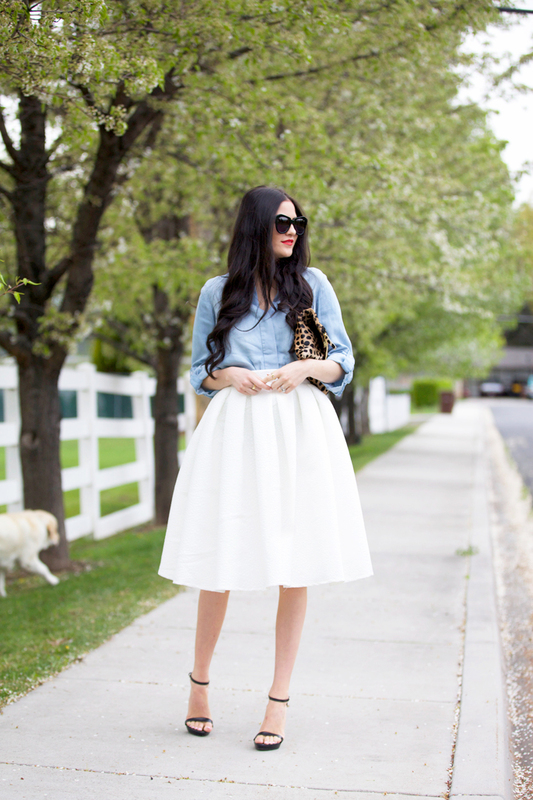 I absolutely love this skirt and the way you styled it with a chambray top. Gorgeous! The skirt from your line is so pretty! I love this look. It has a neutral palette with a feminine touch! Such a gorgeous skirt and perfectly matched with the chambray top! Super cute!!! Loving that skirt..
5 Years!! That’s really great! How exciting to feature a piece of your own. The skirt is lovely. You look beautiful! I like the animal print touch! I love this look. I agree that black, white, chambray and leopard are perfect! You are the perfect model for your designs! Love this skirt!! That’s so nice of you to say!!! Thanks Caitlin. So gorgeous, as always. Adore the skirt! Looking like a Modern Day princess!! Superb minimalistic and very elegant outfit! I was just on your site trying to decide what piece to purchase! LOVE this skirt on you…it may be the winner! That skirt is amazing plus the pockets just sealed the deal. Beautiful! I totally agree!! haha thanks for stopping by! Love this look! So classic and gorgeous!!! Gorgeous!!! I love the flare of the skirt. You did an amazing job designing! wow this look is so fresh and just beautiful! A ladylike outfit can never be wrong! Gorgeous outfit! I love how you styled the skirt! 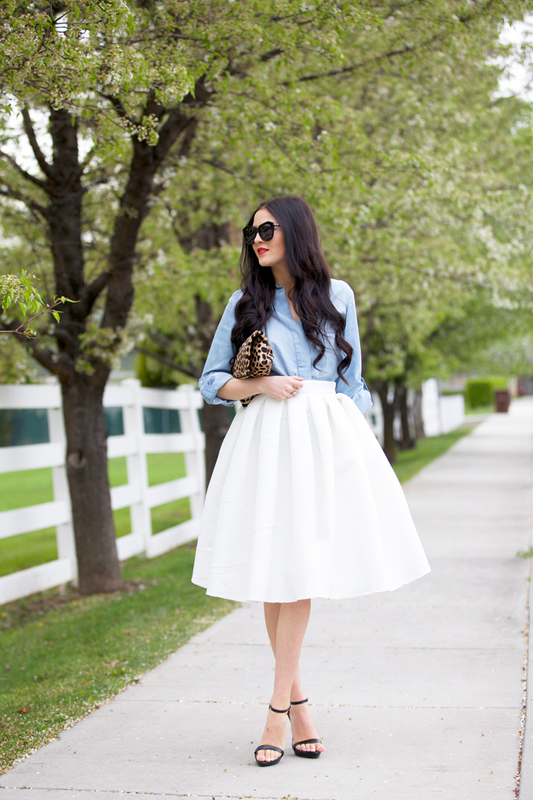 I love the chambray shirt with that white skirt! Such a pretty look. I love the full skirt! Such a pretty spring look? What a pretty skirt! Your whole outfit is cute! Love this look on you! The website said the skirt runs small. Do you mind sharing what size you are wearing above? I agree, this is such a great combo! And that skirt is so pretty! Congrats on your amazing clothing line! Dash is a pro photobomber! haha but we love him anyway! I totally love this look!! So feminine and classy! Thank you Lauren! That’s so sweet of you to say. It has POCKETS?! Omg k I need this:)! It’s seriously beautiful! I love how flared that skirt is!! It’s so pretty and girly but looks really cool with that chambray top. Gorgeous!! I came across your blog recently. Love the warmth in all your posts. And the skirt looks fantastic! Please do visit my blog too. I am an Indian and started fashion blogging recently.You are truly an inspiration! Gorgeous!! You always look so elegant in full skirts… I’ve never found one I love on me. But I love a good chambray shirt! Your line is beautiful! Congratulations on the success! !